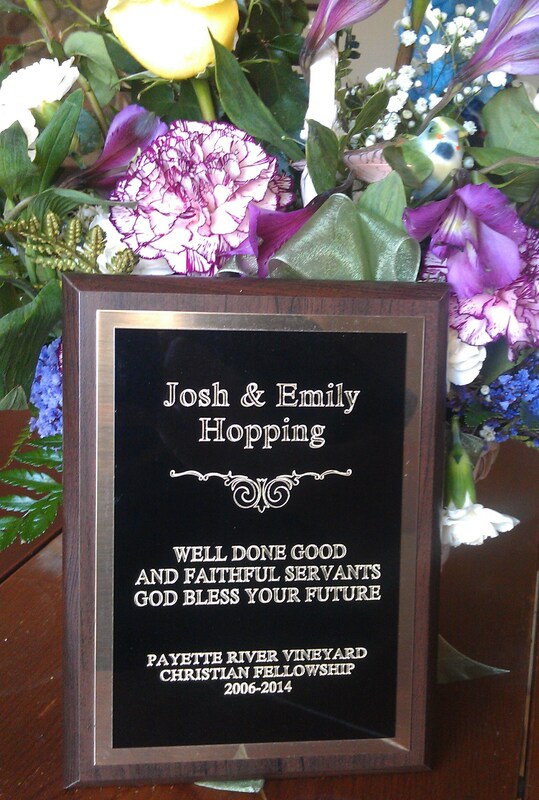 Twelve days ago on June 1st Emily and I officially stepped down as the pastors of the Payette River Vineyard Christian Fellowship (PRV). 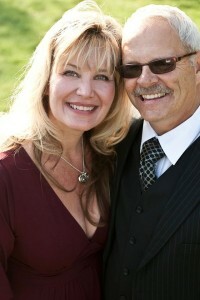 At the same time the King and the church body commissioned Richard and Mardie Engelhardt as the new pastors. Wow…I’m amazing at the emotions that came with typing that statement… it is all kind of crazy and hard to believe… a year ago the thought of leaving Sweet was a distance thought…now it is a reality. Last year I was privately wrestling with trying to balance my day-job, leading the church, being a husband and a father…not to mention trying to maintain a health spiritual life… I was, quite frankly, very close to burn out and was starting to be ineffective in all areas of my life as I was simply reacting to events rather than having time to process and plan ahead. At the same time there was a growing desire within Emily and mine hearts to start a new church somewhere or, at the very least, to engage in ministry in a different cultural context. Yet for all the discontentment and pain, I really couldn’t see a way out of this crazy catch 22… Then a series of event took place which ended up with me attending the Vineyard Missional Leaders Meeting (MLM) last October. At that meeting the Lord connected me with several people who helped me pray through and process the growing discontent in my heart. The second issue was a tad harder…or so I thought… Karen Fields and Jared Boyd both encouraged me to think out of the box and trust God to take care of the people, as He loves them far more than I ever could. Accordingly, I mustered up some courage after I returned from the MLM and talked to the PRV Elders about the possibility of stepping down. They, in turn, surprised me in saying that they knew this was coming and that they full supported Emily and me moving on to something else. All they asked is that we would stay with them until June 2014, after which they would release us to follow the call of God on our lives. Then in a move only God could orchestrate, I found out that the Vineyard USA had decided to host their very first pastoral transitions conference in Boise…and, if that wasn’t enough, the speakers included my sending pastor (Tri Robinson), area leader (Trevor Estes) and regional overseer (Allen Hodges). It was like God was saying, “You are on the right path.” So Emily and me went – taking with us one of our Elder couples – and had a great time learning about how to help lead a congregation through a leader change. Then on January 5, 2014 I bite the bullet and told the church body about what God was doing in Emily and my heart. The church’s response was amazing as pretty much every person there confirmed to us that we were indeed supposed to move on. Folks were telling us stories about how God told them that we were leaving weeks before as they were walking up to us in church…or how earlier that week God had told them during their devotional time… it was, quite honestly, unexpected and thrilling at the same time!! Yet at cool as all that was, the problem still remained that there was no one ready to step in after Emily and I stepped down… Seeing how the Elders had asked us to stay until June 2014, it looked like we had six months to figure something out… either by finding another pastor somewhere or by setting up a group of rotating teacher/elders… everything was on the table at this point and no option was being ruled out. The coaching of Karen Fields was even more invaluable during this period than in the previous few months as she helped Emily and me think through all the issues and guide both the Elders Board and the congregation as we all sought to discern what Jesus was doing in our church. Of the three candidates, one of them dropped out during the screening step as she didn’t feel like it was a good fit. The other two candidates visited the church with their spouses and were interviewed by the church’s Elders Board. During this process, Richard and Mardie quickly stood out as folks who had the same values, beliefs, and practices as PRV (it helped that they were out of the Vineyard Boise). Basically they just fit the PRV culture and really loved the people, which were the primary things we were looking for.… so we started walking forward on the transition path with them (a huge shout out to Trevor Estes for helping us on this transition and connecting us with Richard and Mardie!!). 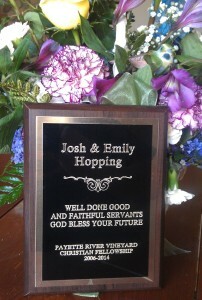 And, well, now they are the official pastors of Payette River Vineyard. Here’s to the King of Kings… may we always say “yes” to Your call. God always prepares and He always provides!